In what kind of baseball game do they let catchers wear masks when they bat? Trick question. This is cricket, the ultimate gentleman’s sport. For more than 50 years, members of the Seattle Cricket Club have kept the sport alive in the Northwest. And it’s worked! Cricket is more popular than ever here. 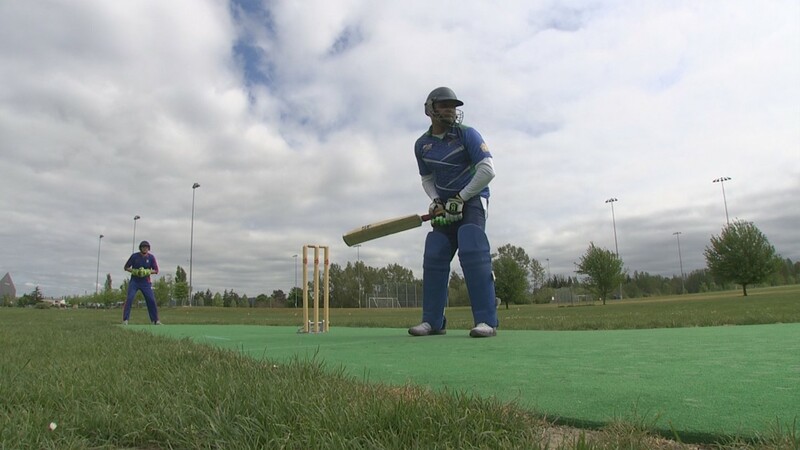 Thirty-six Seattle teams are playing cricket, a game older than baseball, but not so dissimilar. There’s a bat, a ball, and a deceptive pitcher trying to get an out. Matt Bennett grew up playing baseball and says some of the skill crosses over. “But in cricket, they try to keep the bat vertical so you’re much more likely to hit that ball,” he said. The wider bats lead to more hits and more runs. In 2006, Australia’s national team defeat South Africa by the score of 872-13. For batters, there’s a need for padding worn in the right places. Even in local league play, pitchers are throwing the ball around 60 miles an hour. Batters wear gloves, a helmet, and something called a box to protect the groin. Evening reporter Saint Bryan took some swings and managed to connect with the lightly tossed ball. The crack of the bat can be infectious. Try it, and you may find cricket is the game for you. There are cricket matches almost every weekend at Warren G Magnuson Park in Seattle. You can watch two Seattle teams compete Sunday, May 20 at 11 AM.